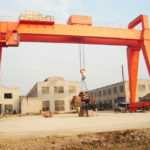 Boat hoist crane is a kind of mobile boat handling equipment used in small to large marinas, shipyards, yacht clubs, water recreation center and navy. 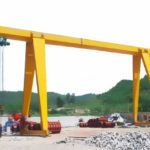 The rated load capacity of boat crane ranges from 25 tons to 1200 tons. 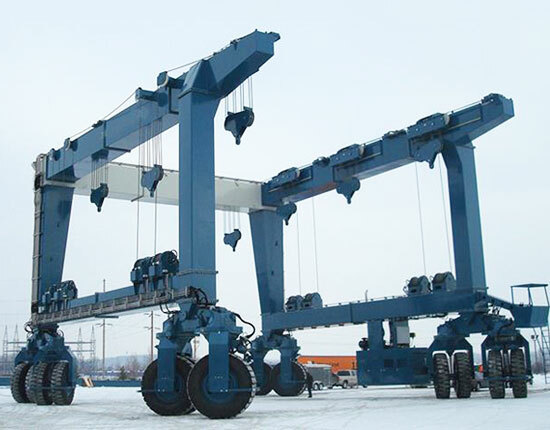 Our boat hoist cranes are available in custom widths and heights to meet different lifting requirements of customers. 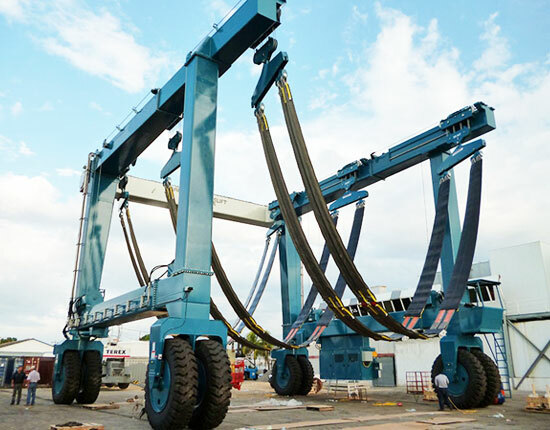 The crane for lifting boats comes in multiple types and configurations to meet your specific lifting requirements. 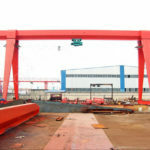 According to the power source, it can be divided into hydraulic boat hoist and electric boat lift. Generally, the mobile boat hoist crane is hydraulically driven, making it suitable for heavy duty applications. It is ruggedly constructed to carry out the most demanding tasks in the yards. While the electric driven boat hoist crane is ideal for small capacity, light duty applications, such as 25 ton travel lift and 50 ton travel lift. It is a cost-effective option for light use. Steering modes: fixing axle steering, 90 degree steering, Ackermann steering, etc. Operation modes: remote control or cabin. The mobile boat lift is engineered to perform the lift-in, lift-out and transportation work. Specifically speaking, it can launch a newly-built vessel into the water or haul a boat out of the water. It can also move and transport ships in the yard to arrange them in a row, thus saving limited yard space. Our mobile hoist cranes can handle a variety of vessels, such as powerboats, fishing boats, sailboats, tugs, patrol boats and barges. 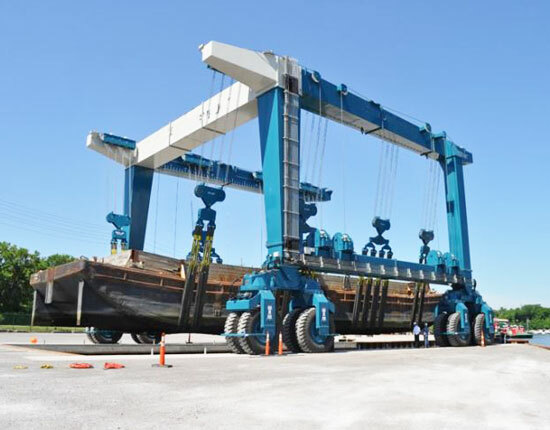 Each of boat cranes can be custom designed and constructed to fit your boat configurations. Whatever your applications, we can design to most suitable boat travel lift that works towards your goals. The main beams and end beams are articulated to allow your crane to travel over uneven ground and reduce structural stress. Different steering modes enable the boat lift crane to get maximum rotation to accommodate extreme yard conditions. The boat is supported using soft and sturdy slings, which will not cause damage to its surface and structure. The hydraulic steering system is controlled by a cylinder or a worm gear. The boat hoist span can be adjusted freely to accommodate the boat configurations. The power can be output according to the load conditions, thus reducing energy consumption. 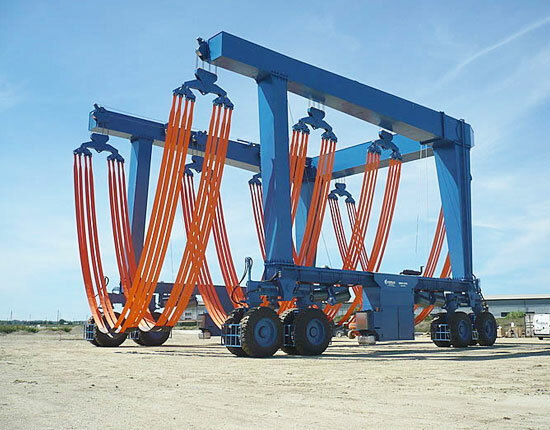 The hoisting mechanism uses a load-sensitive hydraulic system. The lifting points can be adjusted to ensure a synchronous lifting. 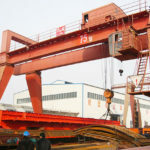 The mobile boat crane is a non-standard lifting equipment that incorporates several simple units and mechanisms, including the double-gantry structure, hoisting mechanism, steering mechanism, travelling mechanism, hydraulic transmission system, control system. These parts and components make it easy and fast to lift and transport a large boat. For further information, talk to one of our boat hoist engineers. What is the required specifications, including the rated load capacity, span, lifting speed and travelling speed? Where will you use the crane, and what is the specific use? How is the environmental conditions? What is the required drive mode, electric or hydraulic? What is the required operation mode, remote control or cabin? 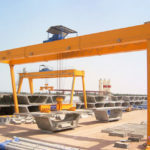 Based on your particular requirements, we will design a highly reliable and efficient marine boat hoist crane with the right features and functionalities. 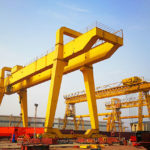 In addition, considering harsh marine environments where the boat crane lift is applied, a durable paint system is used for better corrosion resistance as well as better appearance. 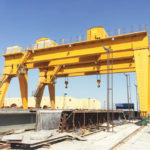 If the vessels you need to lift and move approach 25 to 1200 tons, you need a boat hoist crane that is built to handle such load. 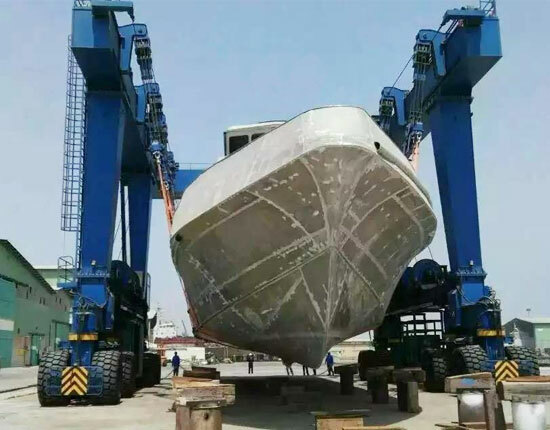 Our boat crane for sale is very durable and affordable so that it can meet or exceed your expectations of fast, efficient and economical transportation for your work boats, yachts, sailboats and so on. What’s more, with sturdy construction and optimal design, our heavy duty boat lifter crane can offer you a trouble-free operation. If you are working with Aimix Group, you can also enjoy a perfect after-sales service since we’ve established 8 service networks and more than 60 after-sales service engineers for overseas market. 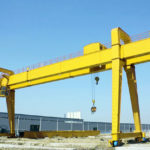 To receive a free boat hoist crane quotation, contact us online now!